Finally it’s here! Friday was not only the Superstar’s birthday but marked the release of his latest film with director K.S. Ravikumar. There has been plenty of hype and expectation for this film, so did the team who gave us the hits Padayappa and Muthu deliver another blockbuster? Well….. mostly. This is a Rajinikanth film so we all know what to expect, and it goes without saying that the outfits will be stupendous, the songs lavish and attention firmly focused on the star in every scene.There is nothing much new about the story, but that’s not really the point, since it’s the entire spectacle and the heroism that’s important and there is plenty of that to be getting on with. 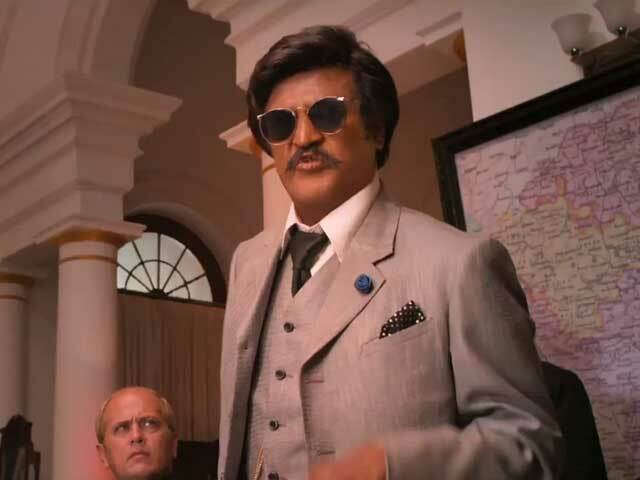 Lingaa delivers most of the Rajni ‘formula’ characteristics we’ve come to expect, and with good performances from Anushka Shetty and Sonakshi Sinha there is plenty to enjoy in full masala style. The film starts with the exploits of Lingaa (Rajinikanth), a thief and con-artist who, along with his merry band of Santhanam and Karunakaran, attempts a major heist at a jewelry exhibition. His outfits are classy and his concept equally sophisticated but Lingaa is foiled in his attempt to sell the jewels on by journalist Lakshmi (Anushka Shetty). Lakshmi is in search of the grandson of Raja Lingeswaran, the only one who can re-open a temple in her village and who just happens to be our jewel thief Lingaa. Using tricks and flattery, Laksmi manages to get Lingaa to go to the village but not before she indulges in a full blown fantasy song with Rajnikanth as the pirate king come to recue her and her backing dancers, who perpetrate crimes on the high seas against the ruffle shirt amongst other fashion crimes. Once in the village, Lingaa is taken aback by the respect shown to his grandfather, but since he himself feels no obligation to the man who lost all the family money, he is content to use the situation purely for gain. However in the course of events, Lingaa learns the full story of Raja Lingeswaran and exactly how he lost his money but won the respect of the people for his life-saving dam. We see all this in flashback mode with Rajinikanth also playing the role of his grandfather, in a beautifully drawn flashback to the 1930’s with period furniture and apparently CGI elephants. No mention though if all the horses, mules and buffalos were CGI too. Back in the thirties Rajni’s love interest this time is village girl Bharathi (Sonakshi Sinha) who has just as epic an imagination as Lakshmi, although she favours a more regal theme in her fantasy. The thirties track starts with a superb fight scene on a train that features Dev Gill as a freedom fighter and touches on the Independence movement, the corruption and cruelty of the British Collectors, and the blind neglect of the Governors, the inequities of the caste system and the struggles of rural India as the farmers battle drought and flood. It’s a bit of a mish mash of ideas, but through it all Rajnikanth walks tall in some wonderfully spiffy costumes and what must surely be the best collection of sunglasses onscreen ever. 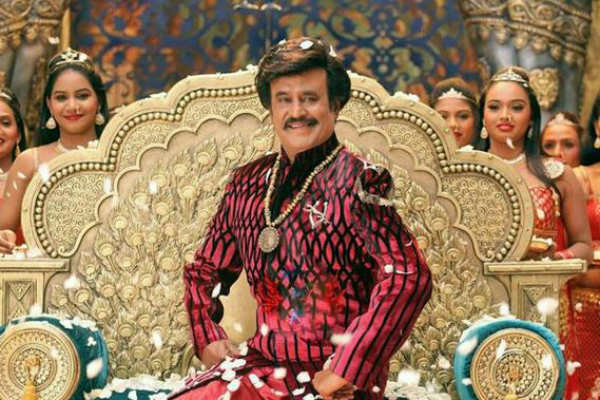 The film looks amazing with obviously no effort spared on the sets and outstanding costuming for Rajinikanth. There aren’t all that many fight scenes, but they are all well choreographed and fit into the main narrative. The train fight scene is undoubtably the best with Rajni stylishly eliminating a train full of bandits with effortless ease, including a one on one with Rahul Dev on top of the train. The action scenes set in and around the building of the dam are also well filmed and the effects well integrated to give the impression of a truly massive construction. The songs by A.R. Rahman are a little less successful, but since the dance numbers are mainly dream sequences, the total switch from the story is a little less disruptive. The songs which move the story forward such as the stirring Indiane Vaa more successful and the background music, also by A.R Rahman, is suitably evocative for each era. I do like the songs and actually like them more after seeing the visual to match, even with those ridiculous costumes in Mona Gasoline! Sonakshi Sinha and Anushka Shetty don’t have a huge amount to do other than as the romance interest for the two Lingeswaran’s, but K.S. Ravikumar does give both of them a few important scenes in their relevant story lines. Santhanam and Karunakaran are also kept mainly in the background and when Brahmi makes a brief appearance early in the film it’s over almost before you realise it’s Brahmi. Still this means the focus is firmly on Rajinikanth and he makes the best use of every moment on screen with one liners, epic speeches and that twinkling smile. Perhaps the only problem I have with Lingaa is the relative ineffectiveness of the villains, although I did appreciate the very normality of their respected self-interest. In the present day Jagapathi Babu does the honours while in the flash-back the actor playing the British collector is suitably sneery but a little too much of a caricature for me to completely believe in the character. The finale also seems a little rushed, especially since the computer graphics don’t work quite so well here as in the rest of the film. However it’s still Rajni doing several impossible things at once while saving the day and the girl (yet again) so for me it’s fine to accept the glaring unfeasibility of it all and just enjoy the spectacle. I really enjoyed Lingaa, and loved watching Rajinikanth in the two separate incarnations of Lingeswaran. The comedy and action in the first half is interspersed with the insanely OTT songs while the second half is more sedate in keeping with the thirties backdrop. I am a big Rajinikanth fan which undoubtably colours my opinion, but this was fun and entertaining. Definitely well worth watching for the Superstar and those wonderful sunglasses! Just as an aside, Lingaa was showing at The Astor here in Melbourne and when I left the cinema I was confronted by a sea of Jake and Elwood Blues lookalikes who were there for the 7pm showing of The Blues Brothers. From one iconic sunglass wearing movie superstar to an iconic movie – it made my day! This entry was posted in Kollywood and tagged A.R. Rahman, Anushka Shetty, Dev Gill, Jagapathi Babu, K.S. Ravikumar, Karunakaran, Lingaa, Rajinikanth, Rajni, Santhanam, Sonakshi Sinha, Tamil. Bookmark the permalink. Thanks for your comment and for the link to your post. You make some interesting comments, particularly in your reference to Amitabh Bachchan and I must admit I’d like to see Rajni in some good character roles. For the sake of his health it would be prudent for him to take things a little easier too, and he certainly has the acting skills to really get his teeth into something like that. But I still loved this film – more than Endhiran to be honest, and I know I’d be disappointed if there wasn’t a full masala Rajni film once every few years 🙂 And therein lies the dilemma – I know these aren’t great films, and the stories are cliched and full of plot holes, but they’re still a Rajinikanth film and they deliver everything I want in that respect. I guess at heart I’m just a fan and happy with whatever amount of Rajni I can get!